Hang onto your hearts because they're going to be stolen by this cuteness! 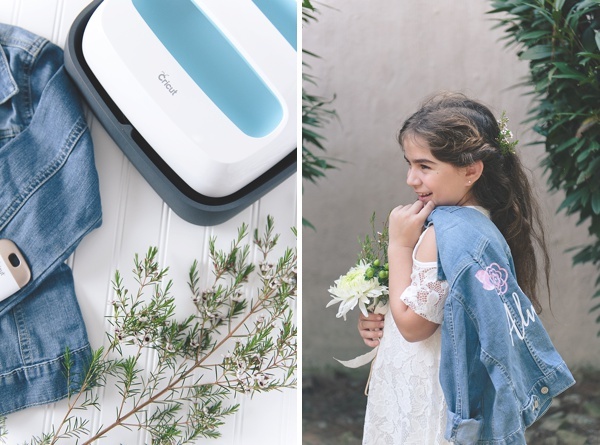 We're spoiling all the flower girls out there with our latest DIY project created in partnership with our friends at Cricut! Showing off their new Patterned Iron-On, we couldn't help but see wedding prettiness and all the possibilities it has for crafternoons with your loved ones. While there are multiple patterned sampler packs from which to choose, we fell head over heels for Natalie Malan's Sunset Blossom set with its watercolor pinks, peaches, and florals, and envisioned the most adorable DIY wedding jacket for those littles who make our ceremonies oh so special. The best part? 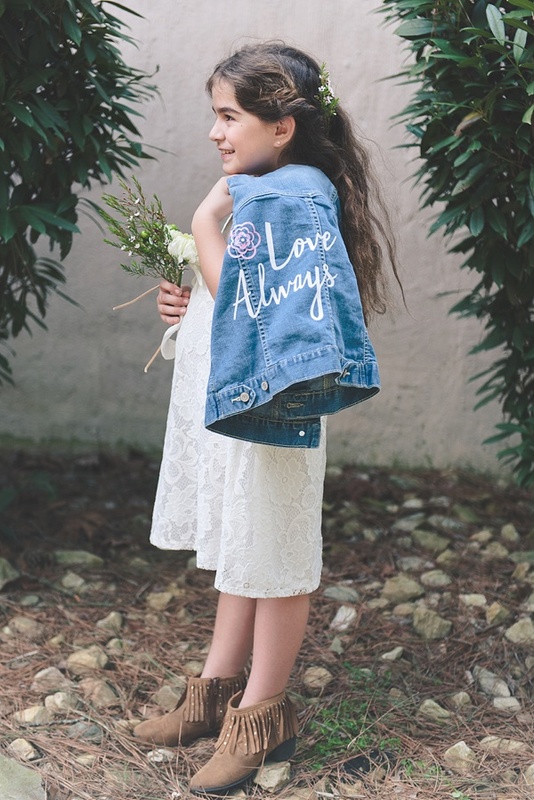 Even if you don't have a flower girl in your wedding, this project can be made for you or any of your wedding party besties! 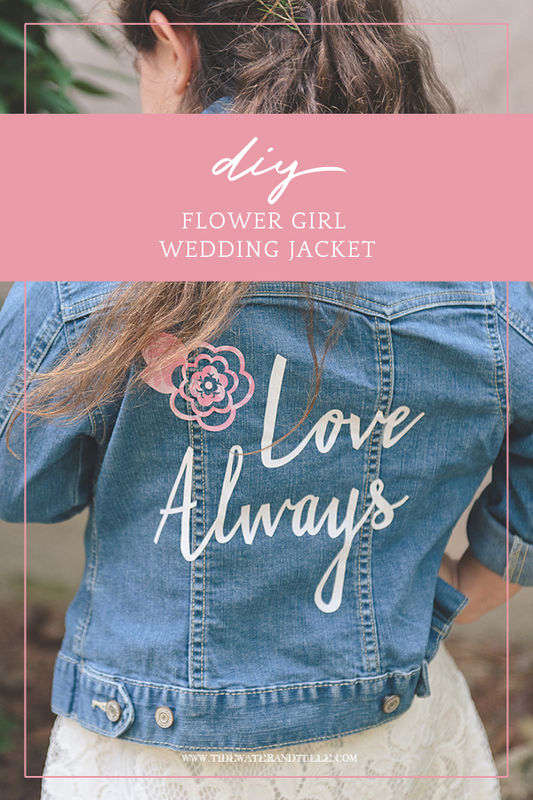 Wedding jackets are so trendy right now, and this DIY is an easy way to make it happen! 1. 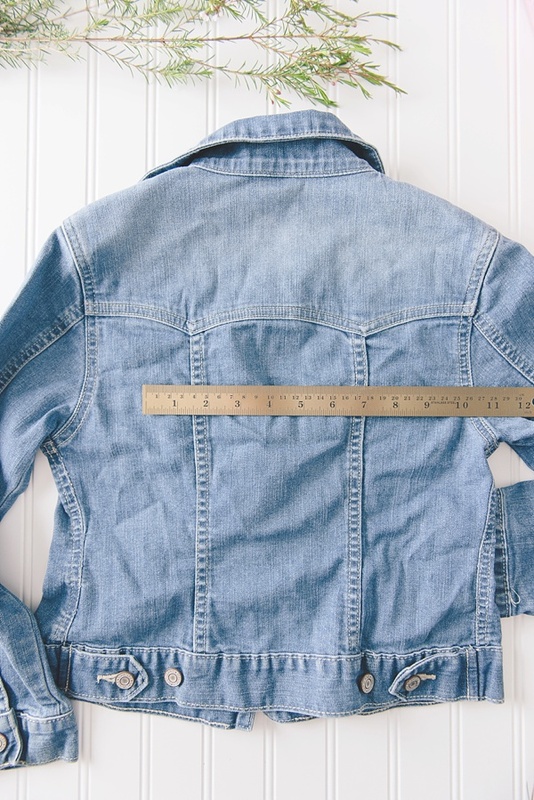 Lay out your jacket of choice and measure how wide you want your design to be. Be mindful of ridges in the jacket and where your design might lay. 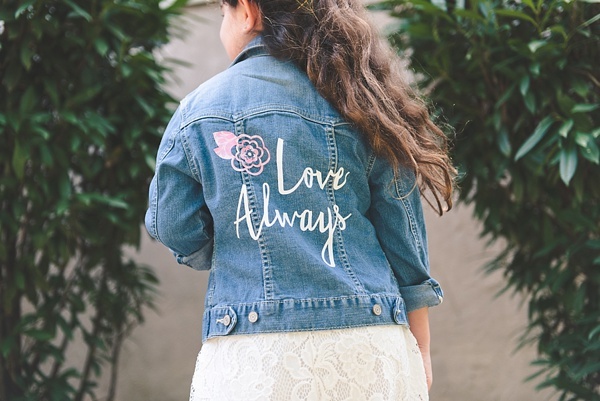 HELPFUL TIP: In Cricut Design Space, you can alter the size of our "Love Always" design based on your project needs. 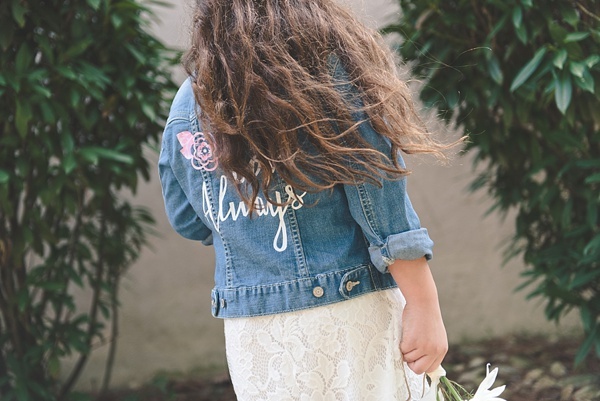 Our flower girl's jacket is a child size medium, so our entire design is no larger than 8" and our flower image is no larger than 3" wide. Feel free to get creative with your own sizing or keep it as is in Design Space! 2. We'll first be cutting out the "Love Always" lettering. 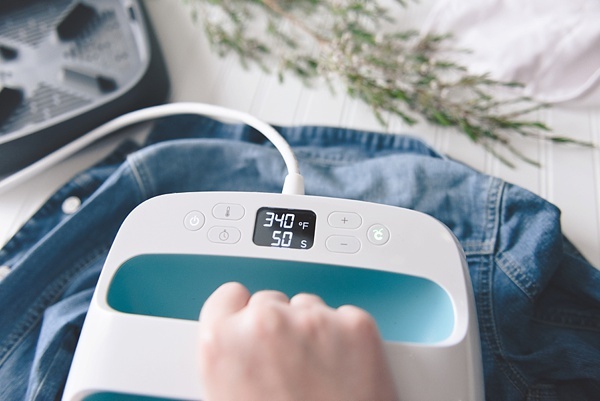 Shiny side down, prep your adhesive cutting mat with the white Iron-On material and feed into your Cricut machine. Open Cricut Design Space on your phone or computer and open our Wedding Jacket project. Set the cut for "Mirror Image On" (so it'll cut "backwards" and iron on properly later) and cut! IMPORTANT: In this project, there are two digital layers because you will use two different Iron-On materials/colors. 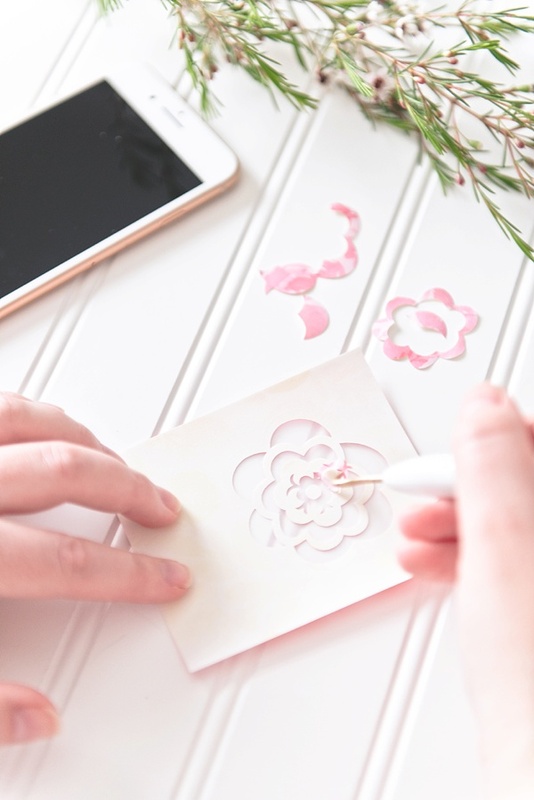 You will need to "hide" the flower layer BEFORE cutting out your lettering. Click "Layers," tap on the pink flower image selection, and then click the eyeball icon at the bottom so that it has a slash through it. This will make it invisible for when you cut out the lettering; this will not cut out the flower at this time. 3. Repeat Step 2, but with the Patterned Iron-On material. Be sure to place the pretty pink pattern face down on the cutting mat. You will now want to "hide" the lettering layer and make the flower image visible in Design Space. Remember to set the cut for "Mirror Image On" again and cut. 4. With the weeding tool, weed both of your cut designs, taking away the Iron-On material that you do not want on your jacket. With the flower design, take note to keep the "leaf" and remove the bits that help show the fun details of the flower. 5. Place the jean jacket on your EasyPress mat and arrange your cutout designs where you would like them to be. You will iron on the white lettering first, so follow the below heating instructions. • Set EasyPress to 340°F. • Preheat section of jacket for 10-15 seconds. • Place the lettering onto the preheated jacket section. • Heat the entire design for 50 seconds with medium pressure. • Flip jacket over and heat back side of the design for 15 seconds. • Slowly remove lining while it's still slightly warm. • Set your iron to the Cotton/Linen setting. Make sure steam setting is OFF for steam irons. • Heat each part of the design for 50 seconds with medium pressure. 6. 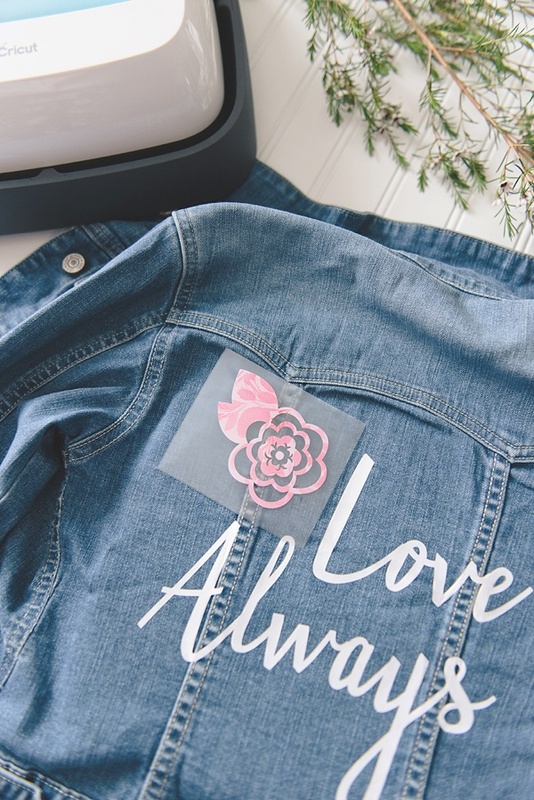 Let the lettering cool before ironing on the flower and then place it on the jean jacket. Take note that the Patterned Iron-On is a different material than the Iron-On Lite, so heating instructions are different. Please follow the settings below for the best results! • Preheat section of jacket for 5 seconds. • Place the flower design onto the preheated jacket section. • Liner must be completely cool before removing! • Preheat section of jacket for 15 seconds. 7. 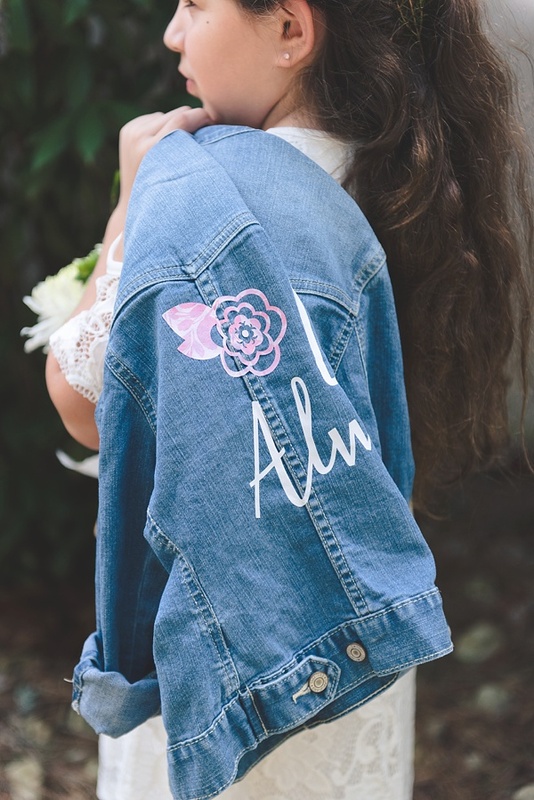 Let your design set for a few minutes and then surprise your flower girl with the cutest wedding jacket ever! To ensure long-lasting cuteness, allow your design to set for 24 hours before washing and then wash your jacket inside out. Be sure to tumble dry on low heat or air dry. 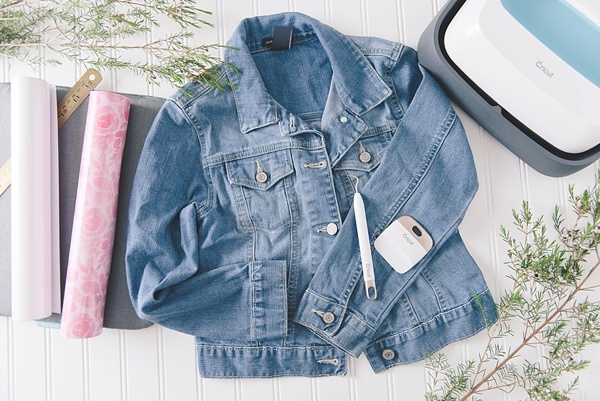 If you need to iron out any wrinkles for the big day, turn the jacket inside out and iron the back side. 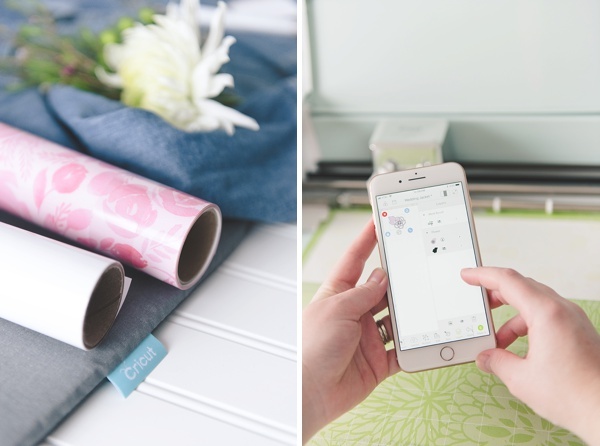 Love your Cricut goodies like we do? Check out our other Cricut wedding DIY projects that are unique and easy to make! 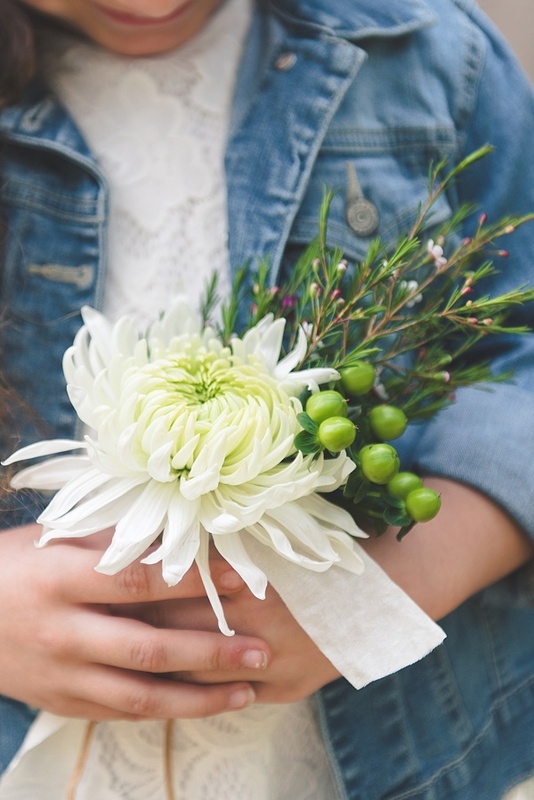 Celebrate Your Flower Girl Even More! Shop Our Adorably Curated Favorites!